Hands-on with Arena and story mode Tall Tales. When Sea of Thieves launched last year, it felt relatively barebones, despite having near-perfect co-op systems for manning a pirate ship with friends. Play it now, and after multiple, substantial updates it's loads better: you can go fight a giant shark, take on entire strings of quests, explore a whole extra series of volcanic islands, or battle AI-controlled skeleton pirate ships. With April 30th's anniversary update, though, it feels more like the game I hoped it would've been at launch, bringing a 10 hour+ story campaign and an uproarious, nerve-wracking PvP Arena mode. I recently had the chance to try both out at Rare's studio. If I'm being honest, the story mode—titled Tall Tales—appeals to me more than Arena, but I can see how both cater to different parts of the game's audience. Arena provides a quick, concentrated shot of ship battling and treasure gathering, taking place over a whole in-game day (so 24 minutes in real time). Tall Tales feel like the kind of starting point the game has always needed, with voice-acted cutscenes, new locations and ways to play that Rare has never tried before. As Rare puts it, the anniversary update is its chance to answer every question about the game at once—and collectively it feels like version 2.0 of Sea of Thieves. Tall Tales is a shared story between you and your crewmates. The first one, launching on April 30th, is a nine-chapter adventure called Shores of Gold, where you're looking for a fabled 'lost island'. This new location is the biggest ever created for the game—it's mentioned offhand that it's about four to five times larger than the biggest existing island, with extensive cave systems to explore. I didn't get to see it beyond a trailer tease, though, as it comes later in what's been described as a 10-15 hour experience, apparently going up to 25+ hours with optional rewards. I tried out the opening chapter. Instead of a treasure map, each part of Shores of Gold gives you a book of clues, rather than a simple map or riddle. The first is the journal of a captain, which hints at locations of where to search for key items to progress—we pick up extra pages as we follow the clues, leading to more destinations. We find a statue in a chest near the wreckage of a ship. We take this to an existing Sea of Thieves island with a waterfall, and find a well-disguised slot that the statue can fit into. This opens up a chamber hidden in a cave wall. From here, we’re tasked with digging up coins hidden around the island, which fit into an altar inside the chamber. When this altar is activated, the chamber door closes behind our crew, and water starts to rise inside the room. Before us are four columns that display symbols, correlating to a clue in the book, and you can spin them around to show a different symbol. I won't spoil exactly how it's solved—it's meant to be an easy way to get started—but it's possible to fail this section and drown, which is kind of cool. Completing this section reveals another object that's key to your quest. Like all Sea of Thieves items, though, these MacGuffins have to be picked up by someone in your crew, and can be lost if you're not paying attention, which might lead to you needing to restart the tale. When the chamber door opens, escaping from this island proves to be frantic. We’re attacked by so many skeletons rising from the ground that we have to sprint for our ship. It's all very Indiana Jones, which is a great fit for Sea of Thieves, but what I love is how refreshingly different it is to a standard experience in the game. This is a beginner-level puzzle, but it was also a cool set piece, and doing it felt like we were all discovering something interesting together. Expect other new mechanics to pop up in Tall Tales, including boss encounters with enemies who have unique abilities, and traps you'll need to watch out for. You'll also get enchanted tools, like a spyglass that can make out the stars in the sky, or an enchanted lantern that illuminates some ghostly apparitions. On this short evidence, it feels like Tall Tales is Sea of Thieves' version of a GTA heist: having players share a story, but making each crewmate feel like they have an important role to play. 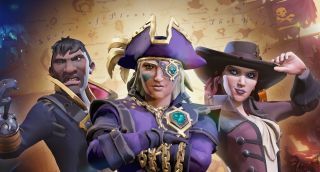 "Early on, there was a lot of feedback from players that they wanted more authored story, and they wanted more authored quests, so we were testing that with some of our campaigns that we put in to figure out how our players would respond to that in a shared world," says Rare's senior designer Shelley Preston. "If we put campaigns in where people all have to go to the same island, how does that work out? All of those learnings have gone into Tall Tales. They're a lot more authored and lore-driven than our little campaign snippets." The same quests can take place in multiple locations, so while you might encounter other crews along the way, hopefully you won't have problems progressing. If Tall Tales is intended for the players who need more story in their Sea of Thieves adventure, Arena is for those who need better competitive options. All the Sea of Thieves drama is present, only truncated: searching for chests using a map, digging them up, and trying to sell them before another crew kills you and steals them. It's based on a smallish map filled with tiny islands and treasure dropoff points marked with red smoke. You earn points for every hit you land on a ship, and lose a serious amount of points if your ship sinks, so it's sensible to pick your fights carefully. Firing off a crew member or two to sneak aboard another ship and steal a chest is a decent strategy, as is ambushing a crew at a dropoff point. Our crew won by some distance across the three games we played at Rare, and avoiding encounters in the journey for treasure was a huge help. If two ships are fighting among themselves and neither is likely to have treasure, it's not worth getting involved if you can go and grab a chest elsewhere on the map. Sometimes, entire crews will make a beeline for the same island that's packed with chests, and you'll take part in huge, daunting sword fights with multiple crews at once. Arena creates the kind of choke points you're less likely to encounter in the main game. I'm well aware, though, that I was sampling Arena in a controlled environment, with the game's director Mike Chapman leading our team, and a nice boy from Shacknews called Sam who's played the game for hundreds of hours giving us a huge boost. Both of them politely and usefully ordered me around, and I dutifully spent the end of our final game just repairing the ship while the rest of the crew did more exciting things (it's quite refreshing to be told what to do when you spend your professional life as a manager). Outside of this preview event, with the regular PC Gamer UK Sea of Thieves crew, I can see us getting seriously owned on Arena's angry seas. Arena is loads of fun, and will actually function as good practice for the game proper if you're not having much luck against rival ships. Like Tall Tales, Arena is described as a 'platform' by Rare, suggesting there's more to be done with it. Even in this shorter form, Sea of Thieves proves as good at creating stories as ever—there's just none of the downtime you're used to. Progress is tied to one of the two new trading companies, the Sea Dogs, who have their own tavern that's used as a shared player space, complete with a winners' podium, indoor cannon, hot tub and vendors. Rare is thinking about ways to bring over some of the game's more exciting unpredictable elements—it's just working out how they fit into PvP. "We want to grow and iterate on that mode," says Neate. "So how can we fold in things that don't quite work as they currently function in Adventure, like Megalodons? Bringing those in exactly as they function at the moment, they just don't work to begin with. How can we tune the Megalodon? Maybe it's an emergent treasure opportunity, that if you manage to kill one, it's got treasure so it pulls people together in a cool way." Some of the best additions in the anniversary update aren't related to either Tall Tales or Arena. It's the non-headline features that will probably make the biggest difference to some players. First up is the long-awaited addition of fishing, progress for which is tied to a new trading company, The Hunter's Call. Fishing is nice and simple, and you can cast off any time you're at sea, or by the water. You don't need to attach bait to your hook, but doing so will help you catch more types of fish. It's as simple as pulling in the opposite direction to the fish, before reeling in when its movement stops. You can reel in at any time to fish faster, but in doing so you risk snapping your line. There are trophy versions of each fish to catch, too—and you can cook them onboard your ship, along with chicken and pork. Eating cooked fish might incrementally regenerate your health, but you've got to be careful not to overcook or undercook it by paying attention to its colour in the pan (thank god Sea of Thieves' only bodily function is vomiting). Cooking fish perfectly and then selling them to the trading company will provide greater rewards, so it's more than just a welcome distraction at sea. Then there's the harpoon on the front of ships, which provides a possible advantage in Arena if you're looking to put pressure on a nearby opponent. You can also fire it at crew members to drag them aboard, or at other in-game objects. After we completed the first section of the Tall Tale, my crew took it in turns to fire themselves out of the cannon while another crew member tried to hit them mid-flight with the harpoon gun. We didn't manage it, sadly, meaning the feat will likely be left to a Twitch streamer to pull off instead. Finally, upgraded ship damage is another exciting element of Sea of Thieves. Masts will fall down now, and need pulling up with ropes before you can repair them with wood. Likewise, individual handles on the anchor wheel and steering wheel can be blown off, making repairs even more important. This makes ship combat more visually exciting, and it's not like masts are falling down constantly. It only happened once during our Arena matches, and one other time when we harpooned a skeleton holding a gunpowder keg, and it exploded into the side of the ship. That one was just funny. It has a lot of potential as a silly tool. There's a lot to deepen players' investment in the game, then, and I'm impressed Rare was given the leeway to keep building Sea of Thieves into what it always deserved to be. It's no small thing to add a whole campaign, with entirely new systems and voice acting. Sea of Thieves spent a year finding its stride—now it's got most of the pieces in place for an exciting future. Update: I've added some gifs. Note this is from B-roll provided by Microsoft, not my own capture.